Jul. 11, 2013 7:00 a.m.
Cora's Restaurant server Maria had the dubious honour of finishing the shave to transform owner John Hellweg from Grizzly Adams to Telly Savalas! All for a good cause, of course, which was raising money to help give local school children a healthy and hot breakfast to start their day! 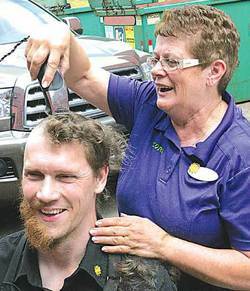 It's not every day a man decides to go from curls to cue ball all at once but this day had been two months in the planning for John Hellweg, the owner of the Leduc’s Cora Restaurant. Normally John can be seen working away at his various duties in the restaurant as a clean shaven guy with short, tidy hair. But over the last two months patrons were beginning to wonder as John let his hair get kind of long and unruly and a rather impressive, (or scary, depending on your opinion! ), beard sprouted and was allowed to flourish. For those who quizzed John on his sudden change in style, they discovered that there was a purpose behind all this added facial fur; namely, hungry kids. "Every year Cora Restaurants dedicate one month to raising funds for our Breakfast Club." Said John. "This year I decided to try and raise a little extra by extending the fundraiser to two months and growing out my hair so the server who raised the most money for the cause could also shave my head!" Now the race was on! Cora's Breakfast Club works with schools that sign on to the program by setting them up with small appliances for a kitchen and a yearly supply of healthy food for the kids. The program costs about $10,000.00 to set up, and depending on the size of the school $8-10,000.00 per year to run it. Any school can sign up for the program and there are currently four schools in Alberta on the waiting list. The money raised from each Cora location stays local to help the schools in that area. Once again Leduc has a reason to hold their head up high as out of 135 Cora locations across the country taking part in the fundraiser, Leduc's Cora raised $3,000.00 which was the third largest amount for a restaurant of its size in Canada. One of the reasons the staff in Leduc were so motivated to raise money for this initiative was that they got to see, first hand, the difference this program makes. John got permission to take his staff to a school in Edmonton that runs the Breakfast Club program and they went in and prepared the food and served the kids breakfast one day at the school. "Everyone really enjoyed serving the kids a good breakfast." Shared John. "It helped to show everyone exactly where their dollars and efforts go." All of the servers at the Leduc store also decided to donate all their tips for one day of work toward the cause as well. Plus several of them continued to donate extra over the course of the two months the fundraising drive was on and that really helped to put the Leduc store over the top. John and his wife Alli actually own two Cora Restaurants; one in Leduc and the other in Edmonton. Between the two they managed to raise $10,000.00 for Cora's Breakfast Club. That is enough to get one of those schools in Alberta off the waiting list and into the program. So on shave day, John had to split his follicles between both restaurants. In the morning he stopped at the Edmonton store and they shaved the left half of his beard and right half of his head. He then drove to Leduc where one of his long time servers Maria, was given the honour of finishing the job. When asked if he would miss all the facial fuzz John admitted that "Having a beard in this industry is difficult. You have to wear both a hair net AND a beard net in the kitchen! To tell the truth it was kind of fun to play with but it didn't look good so I am glad to get rid of it. Besides, Alli hated it!" He laughed.